Startups that work in the business-to-business space often run into cash flow problems because business clients often pay invoices on net 30 to net 60 days. Few entrepreneurs account for this issue in their financial forecasts – but it can have a real and serious effect. This problem can often affect cash flow when the company is growing quickly and you least expect it. Basically, you run out of cash because all your money is tied to slow-paying invoices. By the way, if you need less than $50,000, I often recommend the SBA Microloan program. This program has many benefits and can help small businesses. However, today I want to talk about another option: factoring financing. This alternative has been gaining traction in recent years as entrepreneurs become aware of it. Factoring is a type of financing that helps solve the issue of slow-paying invoices. It works by financing slow-paying invoices. The factoring company provides you with an advance, often a percentage of the gross value of your invoices. This advance gives your startup funds to operate. The transaction concludes once your customer pays the invoice in full. Companies often factor invoices on a recurring basis until they have built sufficient reserves. Most factoring companies finance the invoice by “buying it.” They often buy invoices in two installments: the advance and the rebate. The first installment, the advance, covers about 85% of your invoice and is advanced as soon as you send an invoice to your client. The remaining 15%, less a fee, is rebated as a second installment, as soon as your client pays the invoice in full. This type of financing has some advantages that are useful for new companies. This is perhaps the greatest advantage of financing your accounts receivable. 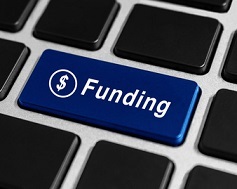 Getting this type of funding is easier than getting a conventional business loan. The underwriting criteria is simpler, which makes it a viable option for startups that don’t have a long track record or substantial assets. It can be set up quickly – often within a week. Most lines can be underwritten and funded in a week, as long as the company does not have any issues. This time frame can help companies that need quick financing. Issues that can delay funding include past bankruptcies, unpaid judgments, and liens encumbering your accounts receivable. The line is designed to grow with your sales. This can be ideal for growing companies. Most factoring companies can increase the amount of invoices they purchase from your company, as long as the quality of the invoices meets their criteria. A factor can help you evaluate the creditworthiness of your potential clients before your sign them on. This assistance allows you to be more selective about whom you offer credit terms to. Obviously, clients with good credit can get net 30 to net 60 day terms. Clients with less-than-stellar credit should prepay. Overall, this strategy should help you decrease your bad debt. In full disclosure, I own a factoring company. So, in an effort to shed my biases, I’d like to give you a list of things you should keep in mind if you are looking into factoring. In principle, a factor doesn’t finance your invoices per se. Instead, a factor purchases your invoices and provides you with an immediate advance for them. One advantage of this structure is that the factor does not examine the assets of your company – too closely. Instead, it considers the credit quality of your invoices. The factor buys only those invoices that are payable from companies with high credit ratings. You can check ratings at Dun & Bradstreet, Experian Commercial, or Cortera. One important detail – while the factor does not look at your company assets too closely, it does look at them to make sure that your company is clear of potential bankruptcy or legal issues. One detail that separates factoring from other types of financing is that your clients will know that you are factoring your accounts receivable. For the most part, this is not a big deal. Most large companies, such as IBM, Walmart, and GM are used to working with factoring companies. However, it’s important that you know this so that you can position this financing correctly. If you decide to use this solution, speak to your factoring provider so that you can determine an effective way to communicate this arrangement to your clients. Factoring invoices is more expensive than a conventional business loan. As a result, it’s best suited for companies that have high margins. The factoring fee is based on the amount of financing you need and the credit quality of your clients. On average, fees for 30 days can range from 1.5% to 3.5% (there is pro-ration). For detailed information, we have a a very detailed factoring guide. If your company has cash flow problems due to slow-paying clients, consider giving them an early payment discount. This approach is usually cheaper than factoring invoices and can work well. Most companies offer a 2% discount if the client pays within ten days. Clients like this option because the discount increases their profitability. Obviously, startups like it because it improves their cash flow. This solution is a win-win.